To Cite: Tsai S, Tsai J. 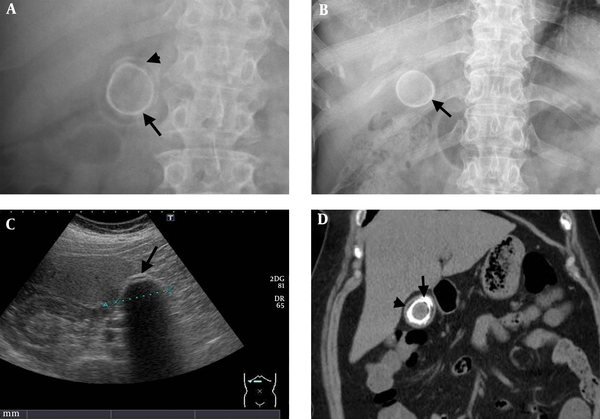 An Unusual Ring-Shaped Gallstone Mimicking Porcelain Gallbladder in a Patient with Chronic Kidney Disease: A Case Report, Iran Red Crescent Med J. 2019 ; 21(3):e63126. doi: 10.5812/ircmj.63126. Background: Porcelain gallbladder is associated with a higher prevalence of malignancy. Prophylactic cholecystectomy is suggested for both symptomatic and asymptomatic patients. Although gallstones are very commonly observed in clinical practices, it is recommended in asymptomatic patients. However, a ring-shaped gallstone may be easily mistaken with porcelain gallstone and requires further investigation using computed tomography (CT) to avoid the unnecessary risks of surgery. Case Presentation: A 71-year-old female with renal dysfunction and diabetes mellitus had a ring-shaped calcification confirmed by abdominal CT scan in Taichung city of Taiwan, in 2016. She had already been followed up for at least seven years. In addition to traditional risk factors, authors believe that renal dysfunction may have also predisposed her to the development of a gallstone. The differential diagnosis of porcelain gallbladder and only ring-shaped gallstone is very important due to different treatments and outcomes. The more attractive part of this case was that the ring-shaped gallstone is rare in clinical practices. Conclusions: For patients with a ring-shaped calcification, clinicians should rule out porcelain gallbladder since such a diagnosis would indicate an increased risk of gallbladder carcinoma. Cholelithiasis is very common in general practices. The diagnosis, treatments, and risk factors are identified. However, the importance of the shape of gallstone was just recently discussed (1). Porcelain gallbladder is a specific calcification of the gallbladder wall (2) detected in 0.06% - 0.08% of cholecystectomy specimens (3, 4). In a systemic review, on patients with porcelain gallbladder, 15% had gallbladder cancer (4, 5). Thus, the difference between ring-shaped gallstone and porcelain gallbladder is very important due to different treatments and outcomes. The current report was on a case with a ring-shaped gallstone mimicking porcelain gallbladder undergoing a seven-year follow-up and reviewed the difference between these two diagnoses and their associations with chronic kidney disease (CKD). The current case was a 71-year-old female with type 2 diabetes mellitus (DM) for 10 years (Humalog Mix50 38 units twice daily), CKD (serum creatinine 3.7 mg/dL) due to diabetic nephropathy, hyperlipidemia (64 mg/dL under atorvastatin 10 mg), hypertension, and obesity (body mass index (BMI) 30.09 kg/m2). Glycemic control was poor (fasting glucose 227 mg/dL and glycated hemoglobin 10.4%). She was frequently admitted due to CKD-related edema of the legs. This time, she was admitted due to legs edema again in Taichung veterans general hospital (a medical referral center) in Taichung City of Taiwan, in 2016. On admission, she had normal white blood cell (7000/µL) without left shift (74% of neutrophil). The blood pressure was 145/95 mmHg. The C-reactive protein was 2.3 mg/dL. Secondary hyperparathyroidism was also noticed, 6.0 mg/dL of calcium, 7 mg/dL of phosphate, and 250 pg/mL of intact parathyroid hormone. In addition to leg edema, she also had abdominal pain; therefore, an abdominal X-ray was arranged, which incidentally disclosed a ring-shaped calcification over her right upper quadrant (RUQ) (Figure 1A). It is difficult to definitively distinguish gallstone from porcelain gallbladder. Ultrasound revealed a suspected 4.76-cm gallstone with acoustic shadow (Figure 1C). The computed tomography (CT) scan showed a ring-shaped gallstone within the gallbladder (Figure 1D). Thus, the ring-shaped gallstone was diagnosed, rather than porcelain gallbladder. After a meticulous review of the patient`s previous imaging studies, a ring-shaped calcification was eventually identified over her RUQ in an evaluation performed seven years ago (Figure 1B). She did not have any signs or symptoms of cholecystitis, and she chose regular follow-up rather than cholecystectomy. The patient gave permission to release her medical data and signed the informed consent (Table 1). Porcelain gallbladder is the calcification of the gallbladder wall and the term is used to describe the bluish discoloration and brittle consistency of the gallbladder wall (6). The wall is brittle and usually takes on a bluish hue and it also also called calcified gallbladder (4). Porcelain gallbladder can be classified according to the extent of calcification (7, 8), including complete intramural and selective calcification. Since porcelain gallbladder could be associated with malignancy (from 5% - 22%) (5, 8), early diagnosis and prophylactic cholecystectomy are essential. Moreover, porcelain gallbladder is associated with cholelithiasis in more than 95% of patients (8, 9). Therefore, the ability to differentiate between porcelain gallbladder and ordinary gallstone is vitally important in clinical practices. In the current case, the diagnosis was established by the absence of curvilinear or granular calcification of the gallbladder wall on the abdominal CT scan and ultrasound. The golden standard imaging modality for differential diagnosis of porcelain gallbladder is CT, which has high sensitivity for calcification and gallbladder cancer. In the current study patient, the calcification was within the gallbladder rather than the gallbladder wall (Figure 1D). On the plain film (Figure 1A and B), the ring-shaped gallstone mimicked porcelain gallbladder. Further CT scans should be performed to avoid unnecessary risk of cholecystectomy in asymptotic patients with gallstone. The risk factors for the reported patient were as follows: female gender, old age, pregnancy (G4P4A0), DM-related gallbladder stasis (10), and chronic inflammation within the gallbladder epithelium (as a carcinogenic stimulus) (8). In a recent study, non-diabetic patients with metabolic syndrome are also risky to gallstones independent of hepatitis C or CKD with dose-dependent manner (11). In addition to the abovementioned risk factors, renal dysfunction may also have predisposed this patient to developing a gallstone. In a large cohort study in Taiwan (12), the prevalence of gallbladder stones was significantly higher in patients with CKD than the ones without CKD. In another cohort in Korea (13), the prevalence of gallstone disease was higher in patients with end-stage renal disease treated with hemodialysis than the ones without uremia. More recently in 2014, there was increased prevalence of gallstone in dialytic patients compared to healthy controls (14). The definite cause of gallstones in patients with CKD is still unknown. However, it may be associated with secondary hyperparathyroidism as a result of increased Ca x P product into bile and crystallization (15). Gallbladder dysmotility due to uremic autonomic neuropathy might cause the increased gallstone in dialytic patients (16). The most attractive part of the current case was that the ring-shaped gallstone is very rare in clinical practices. Besides, some patients with ring-shaped gallstone received unnecessary cholecystectomy due to the misdiagnosis of porcelain gallbladder. Authors highlighted the importance of this differential diagnosis against its rarity. However, there were some limitations. Firstly, it was only one case report. Secondly, there was no definite diagnosis for the current case since there was no pathological diagnosis. Thirdly, due to very rare reports about ring-shaped gallstone, not many reported studies with discussions were cited regarding this interesting differential diagnosis. For patients with ring-shaped calcification over RUQ, clinicians should perform abdominal CT to exclude any possibility of porcelain gallbladder. Prophylactic cholecystectomy may be considered in porcelain gallbladder even without symptoms, but only observational follow-up is recommended for gallstone. 1. Qiao T, Ma RH, Luo XB, Yang LQ, Luo ZL, Zheng PM. The systematic classification of gallbladder stones. PLoS One. 2013;8(10). e74887. doi: 10.1371/journal.pone.0074887. [PubMed: 24124459]. [PubMed Central: PMC3790764]. 2. Ochsner SF, Carrera GM. Calcification of the gallbladder ("porcelain gallbladder"). Am J Roentgenol Radium Ther Nucl Med. 1963;89:847-53. [PubMed: 13939432]. 3. Kane RA, Jacobs R, Katz J, Costello P. Porcelain gallbladder: ultrasound and CT appearance. Radiology. 1984;152(1):137-41. doi: 10.1148/radiology.152.1.6729103. [PubMed: 6729103]. 4. Jones MW, Ferguson T. Porcelain Gallbladder. StatPearls. Treasure Island (FL); 2019. eng. 5. Khan ZS, Livingston EH, Huerta S. Reassessing the need for prophylactic surgery in patients with porcelain gallbladder: case series and systematic review of the literature. Arch Surg. 2011;146(10):1143-7. doi: 10.1001/archsurg.2011.257. [PubMed: 22006872]. 6. Berk RN, Armbuster TG, Saltzstein SL. Carcinoma in the porcelain gallbladder. Radiology. 1973;106(1):29-31. doi: 10.1148/106.1.29. [PubMed: 4682728]. 7. Shimizu M, Miura J, Tanaka T, Itoh H, Saitoh Y. Porcelain gallbladder: relation between its type by ultrasound and incidence of cancer. J Clin Gastroenterol. 1989;11(4):471-6. [PubMed: 2668401]. 8. Goel A, Agarwal A, Gupta S, S. Bhagat T , Kumar G, K. Gupta A . Porcelain gallbladder. Euroasian J Hepatogastroenterol. 2017;7(2):181-2. [PubMed: 29201805]. [PubMed Central: PMC5670266]. 9. Polk HC Jr. Carcinoma and the calcified gall bladder. Gastroenterology. 1966;50(4):582-5. [PubMed: 4286335]. 10. Guliter S, Yilmaz S, Karakan T. Evaluation of gallbladder volume and motility in non-insulin-dependent diabetes mellitus patients using real-time ultrasonography. J Clin Gastroenterol. 2003;37(4):288-91. [PubMed: 14506384]. 11. Tsai CH, Wu JS, Chang YF, Lu FH, Yang YC, Chang CJ. The number of metabolic abnormalities associated with the risk of gallstones in a non-diabetic population. PLoS One. 2014;9(3). e90310. doi: 10.1371/journal.pone.0090310. [PubMed: 24598574]. [PubMed Central: PMC3943896]. 12. Lai SW, Liao KF, Lai HC, Chou CY, Cheng KC, Lai YM. The prevalence of gallbladder stones is higher among patients with chronic kidney disease in Taiwan. Medicine (Baltimore). 2009;88(1):46-51. doi: 10.1097/MD.0b013e318194183f. [PubMed: 19352299]. 13. Hahm JS, Lee HL, Park JY, Eun CS, Han DS, Choi HS. Prevalence of gallstone disease in patients with end-stage renal disease treated with hemodialysis in Korea. Hepatogastroenterology. 2003;50(54):1792-5. [PubMed: 14696406]. 14. Genctoy G, Ayidaga S, Ergun T, Lakadamyali H, Erbayrak M, Sezer S. Increased frequency of gallbladder stone and related parameters in hemodialysis patients. Turk J Gastroenterol. 2014;25(1):54-8. doi: 10.5152/tjg.2014.4854. [PubMed: 24918131]. 15. Cariati A. Blackberry pigment (whitlockite) gallstones in uremic patient. Clin Res Hepatol Gastroenterol. 2013;37(2):e69-72. doi: 10.1016/j.clinre.2012.08.004. [PubMed: 22959097]. 16. Nowicki M, Zwiech R, Dryja P, Sobanski W. Autonomic neuropathy in hemodialysis patients: Questionnaires versus clinical tests. Clin Exp Nephrol. 2009;13(2):152-5. doi: 10.1007/s10157-008-0121-y. [PubMed: 19153803].